LUCKY HAUNTER slot machine presented at the website is made after Igrosoft’s slot machine of the same name. Thus, LUCKY HAUNTER as before is the slot machine with 5 reels, option to double your win in gambling game, and chances to get lucky in bonus and super bonus games. 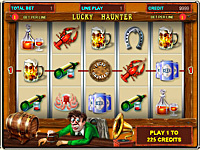 This version of LUCKY HAUNTER slot machine has a completely redesigned interface, but it retained logic and controls of its predecessor. All reel symbols have retained their value, hence payout tables remain unchanged. The most important difference of our slot machine is that fair play control is added to the game. This means that slot machine has become completely “transparent” for the player for the first time ever. Completely, because in fair play control section you can see reel layout with the number and order of symbols, and besides covering the main game, fair play control system also allows to make sure fair play of gambling game, and control bonus and super bonus games. Fair play control system covers virtually every step of slot machine play. In the main game, before new spin, you can select the number of lines from 1 to 9 by pressing LINE 1 ... LINE 9. Bet per line from 1 to 25 credits is set by successive pressing BET button. Denomination of one credit can not be changed. At our website, we offer slot machines where one credit costs 0.01 xBTC and 0.1 xBTC. You can spin the reels by pressing START. If any line where the player has a bet, has three or more same symbols standing side by side, including outer reels, you win according to the pay table available when pressing HELP in the game window (page 2, page 3). Horseshoe is a wild symbol, it means that it can replace any of the symbols on the reels except Lucky Haunter symbol. In case where wild symbol on any line makes two combinations, the combination is paid with a greater win coefficient. When playing for cash, autoplay function becomes available that is activated by an additional button to the right of START button. In this mode, if there is no win in the main game, the reels make next spin automatically. BeerCan=1, 15, 8, 3, 10, 4, 6, 7, 11, 12 |...... is a part of the initial line for gambling game. If you wish, after payment in the main game, you can try to double your win. To do this, press DOUBLE. Four beer cans are shown to the player with a hidden numbering, and “Barman” can with a random number. By using LINE 3 ... LINE 9 buttons, the player shall choose one of 4 cans. If the number on the selected can is higher than the number on “Barman” can, win will be doubled and a new level of gambling will be offered to the player. If the player opens the can with a number lower than the number on “Barman” can, he loses his current win. Equality of numbers on cans means draw, and the player goes to the next level of gambling. This game has NINE gambling levels. The player may abandon another attempt to double and take cash after he sees the number on “Barman” can. To abandon gambling, press START. Bonus game appears randomly, like other combinations providing payments. Bonus game requires that three or more beer bottle cork symbols appear on the entire screen (on any of the fifteen visible symbols of all 5 reels). Wild symbol can not be considered as cork symbol and does not affect the appearance of bonus game. Bonus game starts automatically after appearance of enough number of corks; if in this case win combinations appeared on playing lines, they are paid after the end of bonus game. The objective of bonus game is to reach super bonus game by turning over the corks (LINE 1 ... LINE 9 buttons) in any order. Bonus credits are hidden on the reverse side of the corks (numbers, bringing a certain win to the player, which retain in case of incomplete bonus game passing), as well as EXIT text, saying that bonus game is over. Super bonus game starts if the player managed to turn over all five corks and get bonus credits for them in bonus game. The objective of super bonus game is to in which of the two dishes is a char-grilled chicken, and get a cash prize from 10 to 70 total bet. Read more about it in Fair Play Control in the super bonus game on the example of Crazy Monkey slot machine. To select a dish press one of the buttons: LINE 1 (left dish), LINE 9 (right dish). All credits won in bonus and super bonus games are multiplied by total bet and are added to total credit of the player after returning to the main game. Ways of reel stopping and gambling game of LUCKY HAUNTER slot machine are the same as the mechanisms previously detailed in Slot Machine Fair Play Control on the example of Crazy Monkey slot. Five numbers after Bonus word (Bonus=2,1,0,5,3), determine the outcome of bonus game. These numbers are generated independently of each other, and can take values from 0 to 9. Each of these numbers determines the prize under the cork, showing the number of credits won. (See the correspondence table below). Numbers 0, 1, 2, 3, in the table correspond to a value of 0 – which means that EXIT text is under the cork, and if the player chooses this cork, bonus game ends. Super bonus game fair play control is similar to Crazy Monkey slot machine. A part of initial line SuperBonus=9,4 determines the super prize. Left number is a prize for the left dish, right number is for the right dish. See the prizes corresponding to the numbers in the table. At any stage of bonus and super bonus games there is an option to set value offset determining the prize, leading to win of a prize not set by the software.